According to Sky Sport football pundit Jamie Redknapp the fate of Blues manager Jose Mourinho now lies firmly on the shoulders of his underperforming team. Last season’s Premier League Champions now languish in 16th place following their 3-1 loss at home to Southampton on Saturday, ten points behind leaders Manchester City who thrashed Newcastle United 6-1 at the Etihad. Following the latest defeat Mourinho vowed that he would never walk away from the team, and that the club would have to sack him in order for him to go, which Redknapp now says is becoming a possibility following their latest loss. “Jose Mourinho is not [just] a good manager, he has been a great manager, said Redknapp on Saturday Night Football. “But the question mark has always been: has he got longevity at a club? Can he keep recreating teams like, say, [Sir Alex] Ferguson has done over the years? “They’ve got an owner that’s trigger happy and has proved that before. Carlo Ancelotti won the double a few years ago and was sacked a year later. “Would it be the right decision? No, but the players will decide it. I’ve been inside dressing rooms, modern-day dressing rooms, and I can see sometimes that the players aren’t really at it for their manager. “It sounds wrong, but it’s true. I’ve felt it and you can see it. “Certain players now will be getting into cliques. You’ve got different languages in the dressing room and one or two will be saying he’s lost the dressing room. “Nemanja Matic and Branislav Ivanovic together might be saying, ‘Things aren’t working any more are they?’ There will be a lot of people looking for parachutes to jump out the plane. That’s modern-day football. “They’ve got to somehow pull it back in. Is Jose capable of doing it? “I’ll give you an example. John Terry, Taking his captain off at half-time at Man City – that doesn’t help. Subbing Matic when you’re 3-1 down – that doesn’t help. 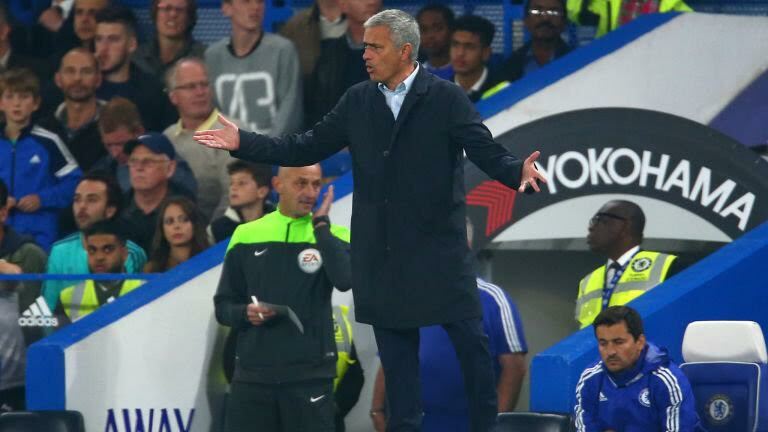 Blaming the players like he is all the time… it’s not what he has done previously. Midfielder Matic was substituted moments after Southampton scored in the 72nd minute, despite only coming on as a half-time substitute. The Sky Sports pundit went on to accuse the players of not being up for their matches and now Mourinho is having a hard time making the right decisions. “You could see that his attitude was, ‘I’m not really up for this’ and then he takes him off again and he’s been sub-subbed. “That’s one of the most humiliating things that can happen to a footballer, I’ve only seen it happen two or three times. “It’s like Jose Mourinho’s head is in a washing machine now, he’s making so many rash decisions. What I used think about Jose is that everything he did was beyond reproach, every decision he made it was like he had a magic wand. Two minutes to go, he make a substitution and bang, bang they’d win 2-1. “Now it’s like every decision he makes seems to be going the other way. Four months ago they were winning the title, everything was going the right way. Now I look at it and I think he’s losing his players, he’s got to bring them back somehow. “You look at that team and it is a shadow of what it was last year. “He’s changing the team, changing the system, he’s rotating all the time, he’s not sure of his best team any more. “The beauty of Chelsea last year was that you knew their best XI, everybody knew it, you could pick it. Now I look at it and everything they’re doing seems to be wrong. “First of all you have to congratulate Southampton, it was a brilliant performance from their point of view. I think they got it right tactically. “They’re a very good side but those players, if they’re behind Jose, they’re doing a bad job of showing it because there wasn’t a tackle made, they never got close to anybody, it was a really poor performance.